To enrol in danceScape Group Workshops, Students can select “Discounted Term Packages” (i.e., 10 week packages in Burlington – $197 plus hst pp; 8 week packages in Burlington – $157.60; 8 week packages in Milton – $120 plus hst pp; 4 week Summer Bootcamps – $78.80 plus hst pp). Regular or “Drop-In” fee is $25 pp per class (if space available). 10-week “Monday Night Practice Pass” Packages are also available at $50 pp plus hst (or $10 pp Practice “Drop-in”). Online highlights videos are available for all eligible classes. Annual flexplan students will receive a special download of our dS Video App to access videos on your Cell phone, iPad/tablet, or computer desktop. 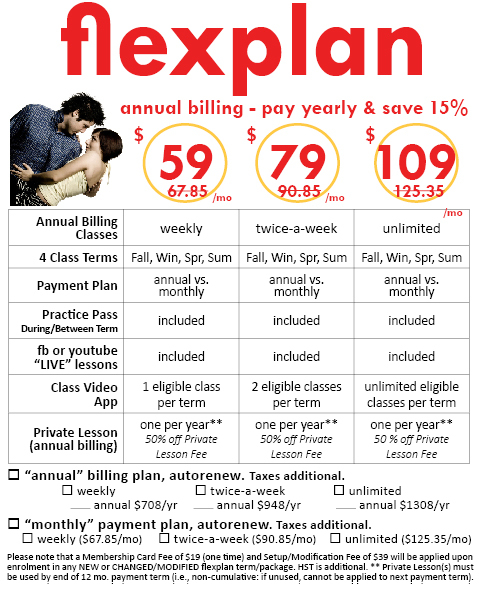 Other students NOT on annual flexplan can pay per online class at www.dancescape.TV. * flexplan Unlimited vs. “10 Week Package/Practice” example assumes 11 available workshop sessions a week (Fall, Winter, Spring programs), 4 available Summer Bootcamp sessions (4 weeks), and Open Practices. Bonuses include 1 Private Lesson per household. flexplan Twice-a-Week vs. “10 Week Package/Practice” example assumes 2 available workshop sessions a week (Fall, Winter, Spring programs), Summer Bootcamp sessions (4 weeks), and Open Practices. Bonuses include 1 Private Lesson per household. flexplan Weekly vs. “10 Week Package/Practice” example assumes 1 available workshop session a week (Fall, Winter, Spring programs), Summer Bootcamp sessions (4 weeks), and Open Practices. ** Group Classes for all flexplan monthly payment plans are applicable only to danceScape’s downtown Burlington location. flexplan clients can choose to attend classes from the following dance styles offered: Ballroom (absolute beginners, level 1, specialty), Club Salsa/Latin (absolute beginners, level 1), danceTONE, and some specialty workshops (e.g., West Coast Swing). Check the online schedule of available classes (some classes are subject to minimum student numbers) and practice sessions at http://lessons.dancescape.com. Please note that lessons and practice sessions are not conducted during Statutory Holidays, as well as blackout periods in March, August, and December (these have been factored into the creation of the flexplan payment plans). A Membership Card Fee (one time setup, or replacement of lost card) of $19 and a Setup/Activation Fee of $39 will be applied upon enrolment in any new or modified flexplan term. A minimum 12-month commitment is required to benefit from the “Save $10 per month” promotion. flexplan payment plans are available for a limited time and cannot be combined with any other promotion on the same service. Please note that taxes are additional. “No Term Contract” clients have the freedom to cancel their monthly plan at any time; however all monthly charges to clients accounts are non-refundable and non-transferable so please inform us in writing at least four weeks before the date of your next billing if you wish to cancel so we can effectively remove you from the autorenew process. “1 year billable flexplan” clients must submit a written Cancellation Request Notice at least 30 days in advance of the final month of your annual contract in order for your request to be effective.